It has nary a drop of meat in it and I drink red wine with it. We have the genius Mark Bittman to thank. Oh, and a can of good tomatoes. The afore-mentioned genius has us drain those tomatoes, chop them in half, sprinkle olive oil and thyme over top . . . and roast them. Yes, roast them. Why did I never think of this before? 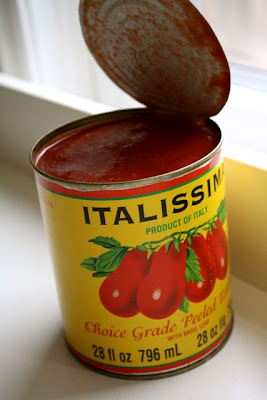 The wet canned tomatoes get a bit dried out and produce these very tasty browned bits that you scrape off and pop into your soup – thus, providing its deep, dark base. With a supporting cast of garlic, carrot and red onion, this soup is much, much more than the sum of its parts. It's so very rich and tomatoey – without a drop of butter or cream (which is a tad sacrilegious for this site, but I am wiling to put up with it to make more of this soup). 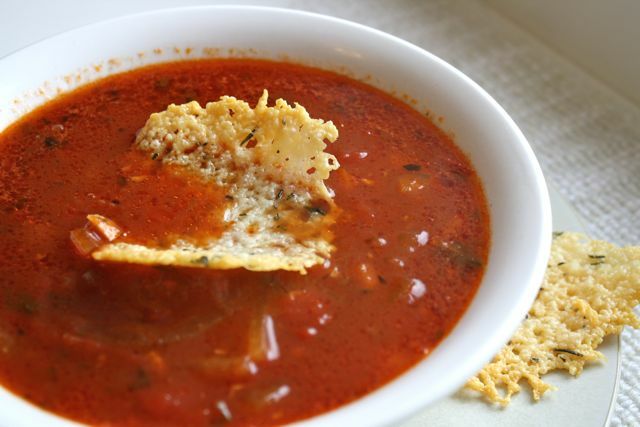 Now, what to eat with your lovely, rich tomato soup? How about asiago lace? 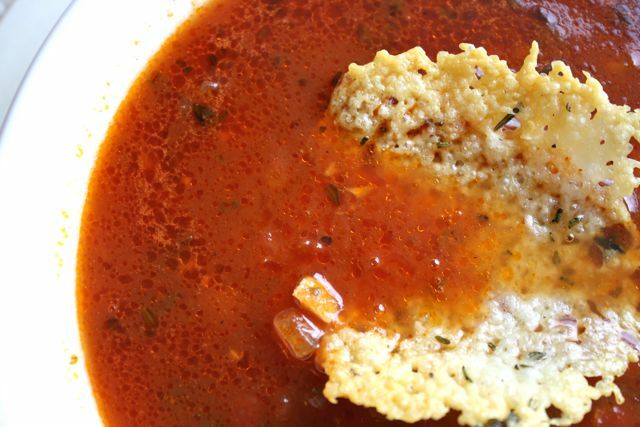 Crisp bits of cheese that crunch next to your silky soup, spiked with thyme and rosemary. Yes, that will do. (And did I mention they're dead easy?) Thank you to the lovely Laura Calder for the idea. There you are. Now you are ready to make dinner. Drain the tomatoes, keeping the liquid. 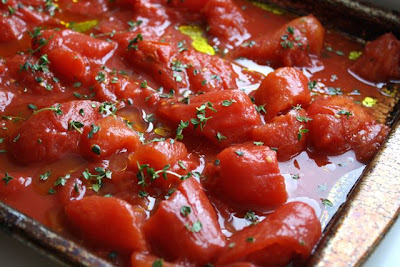 Cut the tomatoes in half and place them on the roasting pan. Sprinkle with 2 tablespoons olive oil and thyme. 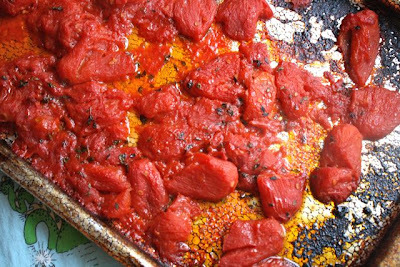 Roast the tomatoes, turning once or twice if you feel like it. Once they are lightly browned or you can see some good brown bits on the side of the pan, they're ready. This will take anywhere from 40 - 50 minutes. Take the tomatoes out of the oven. While your tomatoes are roasting, prepare the supporting cast. Heat a thick-bottomed pot over medium heat. Add the other 2 tablespoons of olive oil. Add the garlic. Stir often for 1 minute. Add the carrot and onion. Stir in the salt and pepper for about 5 minutes. Add the stock, the roasted tomatoes and the reserved tomato juice. Use a bit of hot liquid to scrape up any dark bits from the pan. 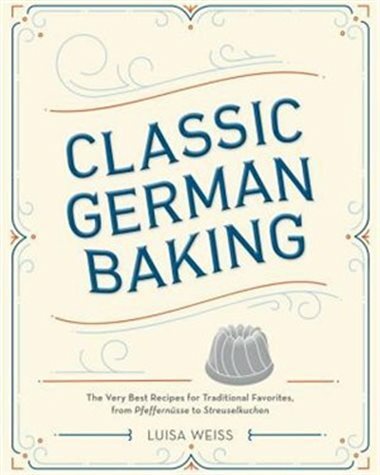 (This is carmelized yum: use it!). Bring the soup to a boil, then back down to a simmer. Cover and cook until the vegetables are tender, about 20 minutes. Stir in half the parsley. Taste and add any more salt or pepper, if necessary. Ladle into bowls. Garnish with reserved parsley and serve (preferably with asiago lace and red wine). Preheat the oven to 400 degrees Fahrenheit. Prepare two cookie sheets with silpat or parchment paper. Stir the cheese and herbs together. Drop about 6 mounds onto each prepared pan. Get out a rolling pin, so you're ready for later. Bake until the cheese melts, bubbles, and turns light brown, about 7 - 8 minutes. Be vigilant! Take the pan out of the oven. 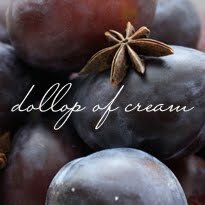 Quickly, use a flipper to lift each lace disc onto the rolling pin. Pat it, so it curves a bit. Drop it off and move on to the next one. Wait until cooled and crisp to eat. Otherwise, store in an airtight container until ready to eat. I just made this soup last night--sooo delicious. I was worried that it was going to be too acidic but it turned out to be smooth and flavourful! !